28th January 2013 – Fast Lane (www.flane.de) today announced that it is the recipient of the EMEAR Cisco Acceleration Award 2012. Cisco unveiled the winners of its 2012 Regional Learning Partner Awards at its Global Learning Partner Conference, Jan. 23, 2013, in Cancun, Mexico. Cisco Learning Partner Awards are designed to recognize exemplary Learning Partners that demonstrate best-in-class business practices and serve as a model to the industry. Areas of consideration include collaboration with Cisco and other Learning Partners; innovation in developing new programs to enhance the student experience; acceleration of growth; and top quality, recognizing an overall commitment to the highest-quality training and enablement. 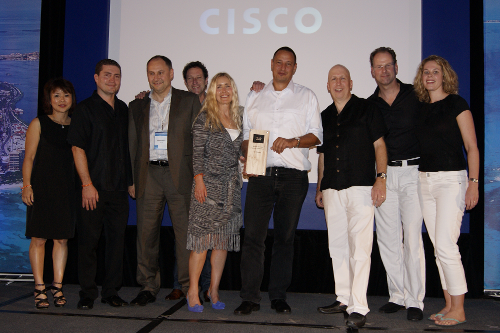 “We are very pleased that we have been able to achieve our goals and that, with this award, Cisco has recognized our growth in the EMEAR training markets. The award reflects the work of our entire team, which has developed a keen sense of the key needs of the markets. On this basis, we can continue to pursue our successful strategy and drive forward Fast Lane’s global development,” comments Torsten Poels, CEO & Chairman of the Board, Fast Lane.